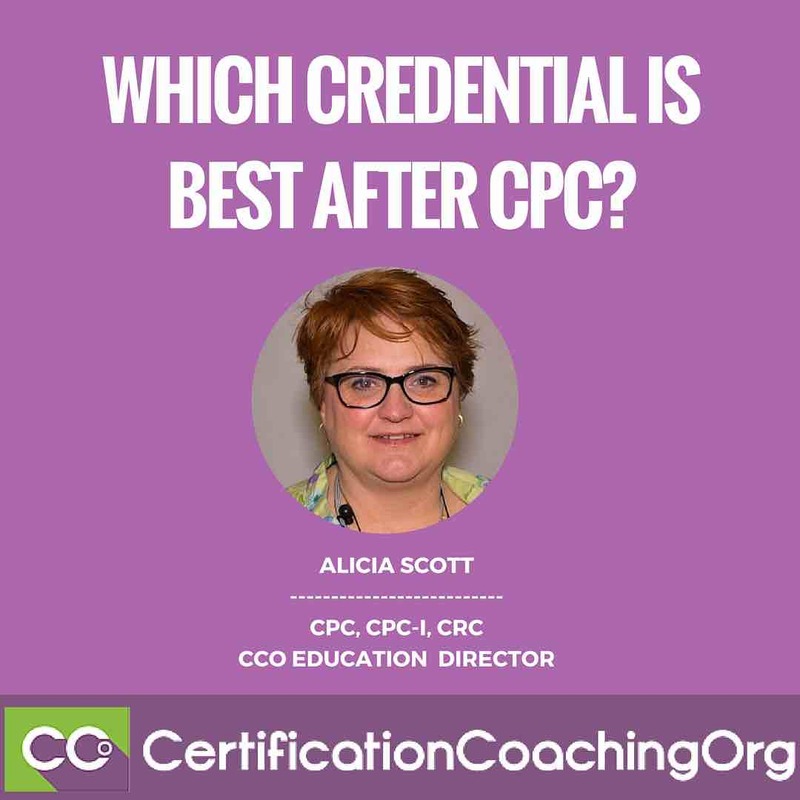 Q: Which credential is the best after CPC? A: Let’s go through a thought process of what you want to talk to yourself about if you want to get a credential after the CPC. The first thing that I like to tell people is to remind them the CPC is a core credential. The AAPC has core credentials and specialty credentials. There’s more than one core credential, but actually the CPC is probably the gold standard, the most widely recognized of all the credentials that the AAPC has. You’ll find people that are CPCs doing all types of coding work –outpatient, inpatient, and specialties because it’s a core credential. So, it’s a great place to start if you’re not sure where to start, we usually advise that you start there. Now that you got your CPC, you’re telling yourself, “That was excellent, I’m so proud of myself,now I want to move on.” Ask yourself these three questions: What area of my CPC training really captured my interest? Was there a particular area that you really enjoyed? Also, what’s the financial responsibility for being multi-credentialed? When you look at me, I have three credentials, but you go and you look at Chandra who has 17 now, I think, working towards 20? You have to pay for CEUs, so it’s something to consider. What credentials are marketable in your area? That’s something very important. Let’s start with the first question. You took your training or you’ve been coding for a while, what’s something that you really enjoy doing? Is it like me, ICD-10? Everybody knows I love ICD-10. Or, is it like Laureen, CPT, she has so much experience in CPT. Maybe it’s a specific body system. Maybe you really like cardiology, or you really like orthopedics; then, there’s an avenue that you can go for a special credential in that area. What if you think, “I really did like the coding, but the concept of the payment methodologies I really enjoy that, and I have a brain for numbers, so I enjoy the behind the scenes, the power players in coding, not necessarily the coding and how that is translated into money” then there’s a path for you in that area. So, kind of identify what your interest is. As we move on, let’s look at the second question: What is the financial responsibility for being multi-credentialed? Now, I took the information from the AAPC, but let’s back up for a second. The AAPC is who we predominantly deal with, most of us have our credentials through the AAPC. There are other organizations, AHIMA being one of them, but there’s billing organizations, one for compliance. The two big power players though are the AAPC and AHIMA. If you choose to get credentialed with two separate organizations financially remember that you will be paying dues every year into both organizations. As it stands now I think the AAPC is like $125 every year and I’m not sure what AHIMA’s is, but it’s comparable I’m sure. That’s something to consider. But know that a lot of times when you’re working, your employer will pay for that for you and they’ll often pay for CEUs as well. Not always, but you might consider asking if you have never done that before and you’re working, “Will you pay for my membership? Will you pay for my CEUs? By the way, will you pay for me to go to conference?” Oh, you might be pushing it there. With the AAPC, let’s look at that, if you have one certification, your CPC, every two years you’re going to need to get CEUs. The first two years, you need 36 CEUs. Now, if you’re a brand new CPC and you’re in that first two-year window, sometimes it’s prorated depending on when you got certified. I think when I first got certified, I only needed 27. I said, “Oh, what happened?” It’s because I came in in an odd time of the year, I was certified in October. So, 36 CEUs; if you have two certifications, it would be 40 CEUs, not that much more, and 3 is 44, 4 is 48. Then, they did a brilliant thing here about a year or so ago and they kept it at 5; with 5 now if you have 5 or more, you get 52 CEUs every two years which actually is very doable. Don’t let that number intimidate you. I did some research, there are a lot of places to get free CEUs, we offer free CEUs, and then we have this webinar charge $5. That’s really unheard of. There are other avenues to get free CEUs. On an average, I would say that one CEU would be anywhere from $30 to $100 per CEU depending on where you’re getting it or if it’s a specialty. You can go to workshops where the AAPC has a lot of specialty workshops. You get 6 CEUs and I think it’s like $189. That gives you an idea. If you go to conference, of course you’re paying to go to conference, but those CEUs are also technically free and you can get quite a few. If you go to conference every year, that pretty well knocks out the CEUs that you need. Again, there are lots of places to get free CEUs. Don’t let that intimidate you, but be aware that that is an ongoing thing, that is a financial responsibility to maintain your certification. Last, let’s talk about keeping yourself marketable. You have your CPC, that’s very marketable as I said before it’s widely recognized. But, think to yourself, “what’s my past experience?” We have lots of students who are nurses, LPNs, lot of RNs. We have transcriptionists, we have people who were billers or working in the front office and have that skillset that JoAnne was just talking about where all the roles of the person in the front, that they have to be really good at or it messes you up in getting paid, getting your reimbursement. If you have that experience, that could sway you into your next credential. Again, think about what your past experience is, if you can identify something that would be really beneficial to a specific credential, that may be the one you want to pick up next. Then, think about where you live. Is there several medical facilities? I’m in Rochester, Minnesota right now. I can walk to the Mayo Clinic, me, my little fudgy buddy, it’s only like a block and a half. It’s like the Mecca of medical facilities right outside my door. That means if you have something like that, that means you are wide open to credentials that would be beneficial to your area or marketable. But if you are in an area that has maybe only one hospital, or what if you don’t have, what if you are relatively rural. Then, that could make a decision for you right there on what credential to pursue next. Is there a preferred credential in your area? Maybe you are in an area that has a lot of surgery centers, so the COC is very popular. That might answer the question for you. Last, ask yourself: Are you willing, or do you have the desire to work remote? A lot more now in the last few years have remote coding blossomed into its own compared to even five years ago. So coders who are new, we used to say, “You’re not going to get to work remote until you have at least a couple of years on your belt.” They’re not doing that anymore, there’s opportunities available to newer coders working remote. Is it because technology caught up with coding, or is it just there’s demand? Again, ask yourself that, which may lead you into another credential. I’ve taken the five probably most popular or most, in my opinion, desirable credentials after the CPC that are pretty much core credentials. Not specialties because mind you, there are lots of specialties, but the next really marketable and valuable credential that you want to consider in a career path. The first, is my favorite of course, that’s why I put it first, CRC. That is really heavy in diagnosis coding, the disease process. If you enjoy that like me, then this is an excellent next credential. It works with risk adjustment. It’s very wide, you can do the money aspect of risk adjustment or the disease process. Still, it’s one that if you enjoy reading documentation and you enjoy the disease process and the diagnosis coding, I would suggest that would be an excellent fit for your next credential. t is very valuable and moving up in the arena really side by side with the CPC is the COC. This is the outpatient facility and ambulatory surgery. One of the advantage of picking up the COC after you’ve got the CPC is the fact that they’re such a similar board exam, the knowledge base is pretty much the same. So, if you’ve taken the CPC, and I could be off a little bit, 80% of the COC is the same as the CPC; so it’s already fresh in your mind. The additional information is going to be the components that deal with these facilities and payment methodologies that are unique to like surgery centers outpatient facilities. In some of the information I was looking at, there’s not so many independent physicians anymore. They are moving towards working with these hospitals and facilities; and so therefore there’s a higher demand for the COC. Out of all of these, if you want to pick up another credential and not have to really stray from the CPC, knock out the COC and it’s again marketable, it looks very good on your resume. Next, I would say if you enjoy that billing aspect, if what JoAnne was talking about just a few moments ago really resonated with you, then the CPB, being a billing specialist is ideal. Very high demand, you can see how, if you don’t have everything working cohesively together, one mistake can knock out like a domino effect and cause a lot of money in lack of reimbursement. So, being a billing specialist is valuable to both physicians and facilities. Auditing, if you have a clinical background already, if you’re a clinician, then you might consider going into auditing. They want you to have core credential, the CPC, but go on and get your CPMA because technically they want RNs to audit. It’s like, you got your foot in the door, and so this gives you the education and the training to show that you’re a specialist in auditing for the coding. A lot of times they’ll have you go in and audit charts for coding before they even hit the coders, before the person is relieved from the hospital. Last, I would say is the CIC. Mind you it’s not last in choices, it’s just the last one that I put up here. Inpatient is fascinating. It’s diagnosis coding, but not just ICD-10-CM but PCS as well, and the disease process again plays a big role. But there’s a lot of information you need to know about the payment methodologies. If that’s something that you think that you would enjoy, then the CIC makes a huge impact next to the CPC because that says you are knowledgeable working with physician coding, anything the physician touches as well as with the inpatient, the facility, and that’s just about all that’s out there pretty much. So, again, these are the core credentials, the basic credentials that I would consider picking up after the CPC. I think that if you really want to do a good job, hit them all, be like Chandra, and get them all. Alicia: No, you do not. In fact, some people get their COC and pick up their CPC. Quite honestly, if you have the CPC or the COC, you’re going to see those credentialed people working in lots of areas. What it does do though, it looks fabulous on your resume, it tells physicians, the providers, and the people that you’re working with that you are a specialist in both areas, you actually hold the credential. That is very important. But those two credentials I would say, and probably even the CIC, not really the CIC, doesn’t work with CPT, so it’s kind of niche, but the COC and the CPC they are sisters and they’re twins. So, you could do one or the other; but having both will bump your pay scale up, put it that way. Laureen: I normally tell people too, it’s like we know what the credentials mean, but sometimes it’s about how are the credentials perceived by potential employers. You want to think about that as well. I consider the COC like a CPC plus a little bit more; so if I was hiring people, I’d know what skills they have by passing either of those exams. But not all employers are that well versed, they just know you have a coding credential. So, if you’re on a budget and you just want to pick one and you really want to work in an outpatient setting, then go for the COC. One more related question: “Are you able to take the CPB (billing credential) the same time as the CPC?” You don’t need one to take the other. We recommend that you go after one credential at a time, but the order doesn’t matter. Alicia: You could do the courses, but I don’t think you’re asking this, but you can’t test for them on the same day. I don’t think you’re asking that. Laureen: No. And you don’t want to do that. Alicia: It’s 6-hour test a piece, but yeah, you could test for one and then turn around and the next testing event available to you, bam! Knock it out. Alicia: Chandra is just dying to chime in, aren’t you Chandra? Chandra: I’m looking at some of these questions and I just really, really want to chime in. The one thing that I’ve seen a lot of questions in the chat about that we failed to mention on here is where does the CCS fit into all of these? Alicia: That’s a good point. Alicia: Before you say something because I know, Chandra has the CCS, I don’t. Laureen had the CCS, so both of them have actually sat for that credential; it’s a well-known inpatient credential with AHIMA. But just real quick, if you’re in an area and you’re looking for employment and you see on the pre-employment they want CCS and they don’t say CPC or CIC, don’t let that stop you from applying for a position. The people that are in HR, that’s just like a format, that’s what they say they want. The AHIMA has been around since the 1920s, some people don’t know anything else exists. They don’t always necessary communicate with the people that you’d be working with. So, don’t let that stop you, apply for it. And maybe they do want a CCS, but don’t let that stop you. Chandra I think wants to say more about the CCS, good credential. Chandra: It’s a great credential. The CCS is through AHIMA, everything else that we’ve talked about here has been through the AAPC. The difference between the CCS and where it fits in with all of these, there is no one-on-one correlation between the CCS and any credential the AAPC offers. The CCS is truly a combination of the CIC and the COC. You have to know it all for the CCS. Would you say that’s a fair statement, Laureen? Chandra: Right. You got to know the healthcare IT aspect of things, you got to know the data crunching; my knowledge – but from a code set perspective, you have to know all four code sets. When I say all four – CPT and HCPCS, ICD-10-CM and ICD-10-PCS. It’s going to test you kind of soup-to-nuts on the whole thing; anything is fair gain. Laureen: We normally advise people make that an aim but don’t start with that credential because you’ll get very discouraged. Currently, they have only about 40% pass rate on the CCS and that’s because people are taking it that really shouldn’t be. They’ll tell you upfront this is designed for people who have been doing inpatient coding for two years. It’s not for graduates of a program to go take it to prove that they have the content. Now, it’s about speed and accuracy as well, which comes in time; so it was designed for people who are already working in a hospital just to prove that they had an advanced level of knowledge. It’s not an entry level. So, aspire to it, get a core credential like the CPC or the COC as a launching pad. That way, you have your foot in both, which is how I started out and I highly recommend that. Chandra: Somebody wanted to know if we have a CCS prep class. Not yet. Chandra: Next quarter we’re looking at the CIC, the CCS prep class, so it’s coming very soon. Laureen: There are a lot of courses you could be taking now that are going to be in that track, medical terminology, ICD-10, ICD-10-PCS; so email helpdesk@cco.us and they can give you. We have an email, all prepared with a different links, so you could at least get started on that. How to Become a Certified Professional Coder FAQs? After I pass the CPC most likely to get is on Evaluation and Management. I never seen this much detail articles on this topic, with Video. Great really great for this articles even I follow capture billing blog for my medical credential services tutor. 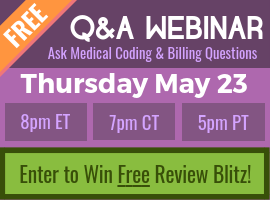 Thanks for sharing keep post on medical billing articles.